Designed to match the lines and profile of our billet receivers like the LRP-07™ and SCR-11™, the JP Flat-Top Scope Mount carries a great reputation for being highly robust and solid with reliable return-to-zero when removed or replaced. Its appearances can be deceiving, though, because this reliable, heavy-duty design actually weighs in comparably to many other popular mounts, meaning you don't have to sacrifice quality for a lighter-weight rig. As it turns out, most of the weight difference between the JP and many other mounts comes from the steel components of the quick-detach (QD) features incorporated by other manufacturers. This QD issue can be a polarizing one, but our extensive competition experience has shown that, preferences aside, most shooters very rarely remove their optic once it's set up the way they prefer, especially while in the field where QD features are most justifiable. What's more, we've never been ones to shirk the aesthetics of our own rifles, and the protruding knobs and levers of most QD mechanisms can be unsightly and look out of place, not to mention to prospect of QD mechanisms to mar receiver rails on occasion. Beyond just mounts, don't forget that we offer a full line of premium optics personally selected by JP founder John Paul. Read more about optics here. The ideal accessory for backup sighting systems, the JPROS is a true quick-detachable 45° rail offset adapter for any Picatinny accessory. Fully compatible with all JP hand guard and rail components, the JPROS is also a solid addition to a quad-rail system to open up mounting at the 1:30 and 10:30 axis positions. The JPROS is available for individual purchase with any of our backup sight options like the JP Short Range Tactical Sight or Troy flip-up sights and as a complete optics bundle with the JPoint Microelectronic Sight. 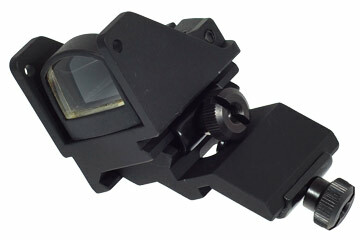 Click here to see our complete iron sight offerings. JP Sight Blocks provide you with a customizable Picatinny rail platform where a hand guard mounting won't serve. Originally designed for mounting at the furthest end of your barrel to achieve the maximum possible sight radius, they're also a perfect solution if you're running a minimized gas system but still need a barrel-mounted iron sight.